Drammatic "ONE" Organic Plant Food is an all natural, 100% organic liquid fish fertilizer which also includes Kelp, Chilean Nitrate and Drammatic Energizer. Liquid fish is one of the finest natural fertilizers available, containing all the macro and micro-nutrients required for healthy plant growth. 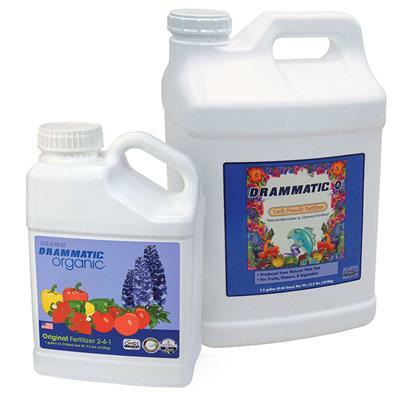 Drammatic "ONE" Organic Plant Food is an all natural, 100% organic liquid fish fertilizer which also includes Kelp, Chilean Nitrate and Drammatic Energizer. Liquid fish is one of the finest natural fertilizers available, containing all the macro and micro-nutrients required for healthy plant growth. Regular applications of fish fertilizer can help bacteria and other beneficial organisms grow and build rich, healthy, well aerated soil. Available in one or five gallon containers. OMRI Listed. Directions: Separation is natural and may occur. Shake well before using. Do not mix more than will be used in one day. Avoid storing diluted fertilizer. 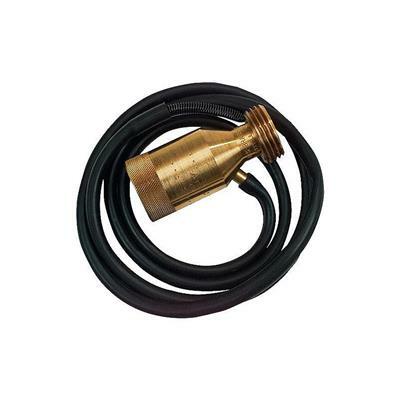 May also be used with hose-end sprinklers. 1-2 ounces (30-60 mL) Drammatic "ONE" to 1 gallon (3.8 L) of water. Apply to 20 square feet (1.9 sq. meters) every 1 week while growing. Punch 1 foot (30 cm) deep holes 2 feet (60 cm) apart in the ground throughout the shaded area of the tree or shrub. Pour 4 ounces (120 mL) of Drammatic "ONE" in each hole for conifers, less for fruit trees, more for shade trees. Dilute 1 ounce (30 mL) Drammatic "ONE" to 1 gallon (3.8L) water. Spray on plant foliage. Do not apply during the heat of the day, evening or early morning hours are best. Foliar fertilization is intended as a supplement to a regular fertilization program. Apply twice a month while growing. 1 ounce (30 mL) Drammatic "ONE" to 1 gallon (3.8 L) water. Apply twice a month as regular plant watering. Fig. 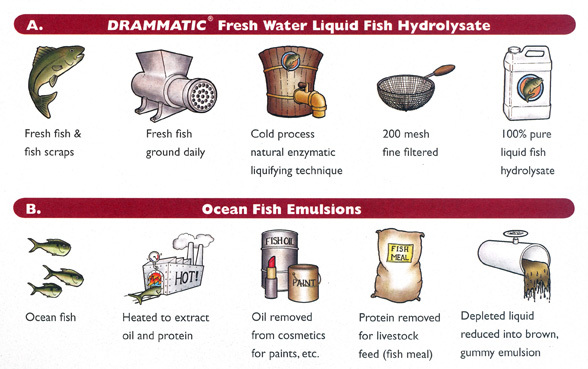 A - Drammatic Liquid Fish hydrolysates contain the natural oils, amino acids, nutrients and minerals found in fish. 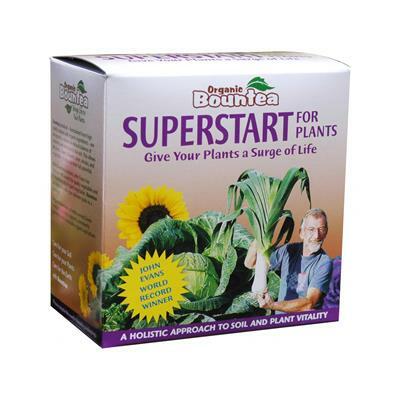 In addition the fertilizer blends include natural ingredients for the needs of different plants. Fig. B - In contrast, the majority of fish fertilizers on the market today are known as "emulsions". First the fish is cooked and the oil removed for paints and cosmetics. Then the protein is removed and dried to make fish meal for livestock feeds. The remaining waste water is condensed into a brown, thick liquid called a fish "emulsion". 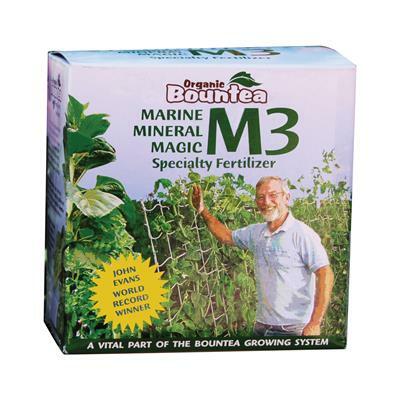 Great fertilizer for gardeners/farmers who want to keep it natural. Just don't use indoors if your starting Transplants unless you want to smell fish for several days. First hand mistake!! Great product from a great company. Product works great, if they can deliver it. Out of 6 separate orders 3 were damaged by UPS. The last order never even arrived because of damage and was not replaced even after several months of repeated calls to Greenhousemegastore. I always got the same friendly response -- We are so sorry, we will send a replacement right away. A replacement has never come and I'm tired of calling. Don't order! 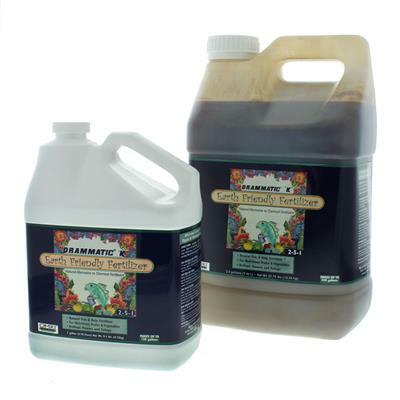 We started using this product in the greenhouse in the Spring with great results. 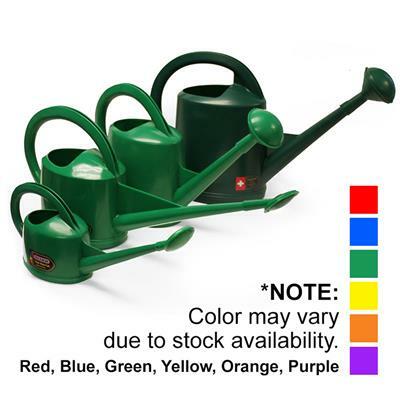 I was so impressed with it that we substituted our granular organic fertilizers for this one in all of our bedding plants, containers, and vegetable gardens. We fertilized every 2-3 weeks and experienced excellent growth habit in all of the annuals and vegetables. The odor goes away quickly, but will be present on the leaves and stems for a couple of days if you grow flowers for cutting or vegetables. i'm native american so i know the fish feeds plants trick. i don't often have access to a fish head or guts, so i use this stuff. i had one tomato plant that husband didn't cover the roots well. i replanted it's poor self and watered it with drammatic o. it only had one tiny leaf left on it when i began and now it's come back to life. i named it lazarus. this stuff is the best. i use it on all my grows. i used to buy it by the gallon on amazon but they no longer have it so i had to find the company to get the size i need. My plants grow really well with this fertilizer! It stinks, lol but the plants do really well with it! All my plants love this stuff, especially the tomatoes & rhubarb. A couple days after I give this to them, you can see a huge amount of growth. My vegetable garden has outshined all my friend's and family's gardens thanks to this stuff. They have the best price, and cheap/fast shipping. Better value than buying Neptunes Harvest F&S gallon locally. I could not be more satisfied with this product. It arrived on time, and although the price is somewhat high, I am planning on using this product again. I've been using this organic fertilizer for 2 years now and my flowers are more beautiful than ever.